Hello and welcome to the second Lacquer Legion monthly manicure! Social media is already blowin' up with fantastic manis from all you lovely people, and now I'm here to throw in my design. I had originally planned to do a look inspired by my new Jeffrey Campbell Litas... But my nail art spikes did not arrive in time! So it was back to the drawing board. What else do I adore? Crochet... Hockey...Cupcakes... Urban Decay... WAIT. "Self, why have you not done UD nails before?!" Tada! I'm sure you UD junkies like me already know where this look came from. Considering I am totally in love with my Vice 2 palette (both the product and the packaging,) obviously it needed to go on my nails. I started this manicure with a base of none other than Urban Decay - Vice. Yes, the polish matches the palette. To get the Vice look, I used the watercolor technique, which I have a tutorial for here. Instead of using a big brush to get a very watery look, I used a small one to make it a bit more distressed looking. I finished off my ring finger with two tear-shaped rhinestones to mimic the bejeweled UD logo on Vice 2. And then I got even more adventurous. I painted the Urban Decay logo on my thumb! Totally freehand. Sometimes I'm boss. I am so so so ridiculously pleased with how these turned out. Already the Lacquer Legion has pushed me to create what I think is one of my best designs ever! That's totally what this nail art initiative was meant for. BRB, gonna share these nails all over Urban Decay's social media in hopes they might see it and I can have a fangirl moment. 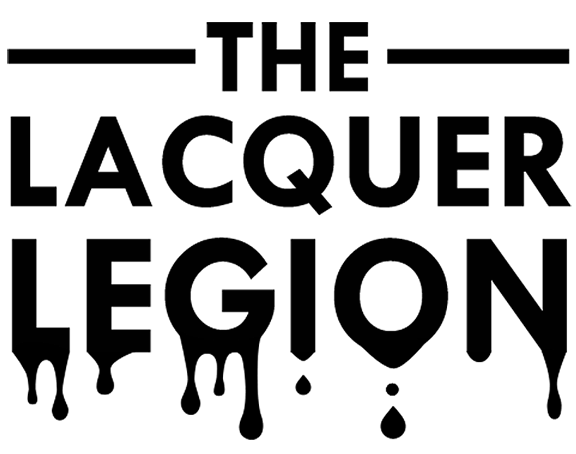 Have you done a Lacquer Legion manicure yet? It's not too late! Be sure to tag your posts on social media with #LLadoration so we can see them! And share 'em on our Facebook page. Cool desingn ! I love the colours ! Cute mani. I love that palette too. UD is my weak spot. Wow! This looks exactly like the packaging! Nice work! I remember you saying urban decay got you into makeup so this mani is really appropriate for this prompt! Great job recreating that vice 2 pattern and freehanding the ud on your thumb that's skill! your logo is perfect!! i can't believe you free handed it, it is perfect!